We expect our ambos to be superhuman, remaining calm, controlling their emotions and thinking and acting clearly, however, the emotional depth of these stories will reveal a whole other side. Sandy is just like you, only she is at the wheel of an ambulance with life and death in her hands every day. Without shying away from the trauma, she shows the reader just how much a life deeply grounded in love can offer. Sandy�s unique perspective as paramedic with the NSW Ambulance Service will open your mind, awaken your heart and shine a light in some very dark places. 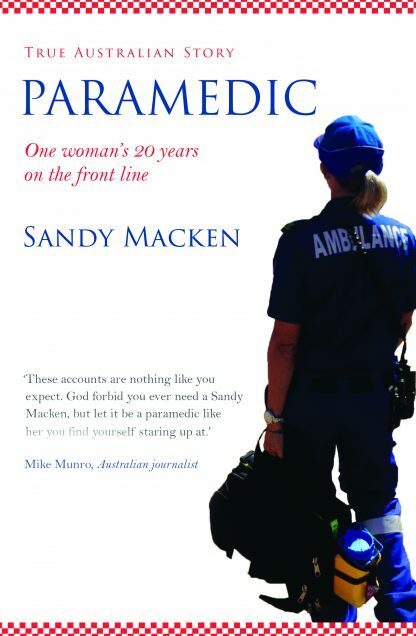 Sandy Macken is a writer, paramedic with the NSW Ambulance Service and spiritual teacher. She has two decades of experience in frontline emergency health, and brings a calm, grounded approach to all she does. High-spirited yet also deeply pragmatic, Sandy is dedicated to fostering good health on all levels, especially among health and helping professionals, Sandy created Peace in the fast lane, an online hub for inspiration and holistic health tools, as well as face-to-face learning zones to enhance and ignite the spirit. Sandy is an energetic and engaging thinker who unites spirituality and practical living. Her blogs have attracted considerable attention and inspired her to write her first book. She has also been published in the international medical journal, EMS World. Sandy holds degrees in health sciences and education and she is currently studying a master�s qualification in counseling and psychotherapy. She has extensive professional and personal experience with trauma, deep transformation, building resilience and fostering a blazing spirit. Sandy lives in Sydney with her partner, and they are looking forward to welcoming their first child in 2018. When she is not working, writing or studying, you will find Sandy speaking to groups, teaching meditation or jetting off to India, where her own spiritual teacher lives, to fill up on the healing energy she so readily shares with everyone she meets.